For its compact size, this contemporary chairside table offers a lot of storage. 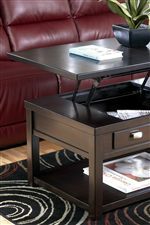 You'll appreciate the value of the two drawers and open shelf plus the table top to accompany your favorite sofa or armchair. The dark finish over select veneers and hardwood with a sleek contemporary style bring fresh appeal to your decor. The Hatsuko Chairside End Table with 2 Drawers & 1 Shelf by Signature Design by Ashley at Walker's Furniture in the Spokane, Kennewick, Tri-Cities, Wenatchee, Coeur D’Alene, Yakima, Walla Walla, Umatilla, Moses Lake area. Product availability may vary. Contact us for the most current availability on this product. The Hatsuko collection is a great option if you are looking for Contemporary furniture in the Spokane, Kennewick, Tri-Cities, Wenatchee, Coeur D’Alene, Yakima, Walla Walla, Umatilla, Moses Lake area. Browse other items in the Hatsuko collection from Walker's Furniture in the Spokane, Kennewick, Tri-Cities, Wenatchee, Coeur D’Alene, Yakima, Walla Walla, Umatilla, Moses Lake area.